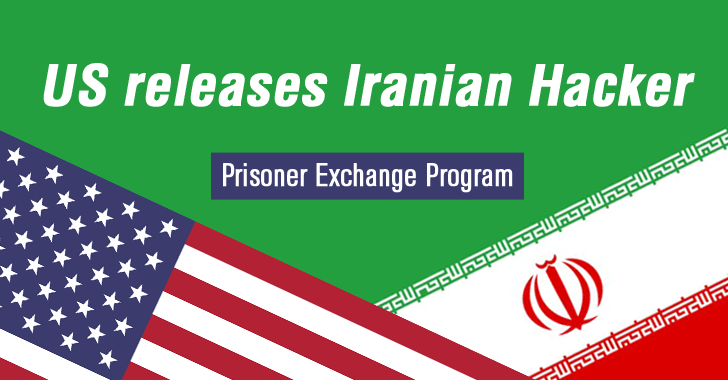 The United States has freed 4 Iranian nationals (including one Hacker) and reduced the sentences of 3 others in exchange for the release of 5 Americans formerly held by Iran as part of a prisoner swap or Prisoner Exchange Program. The Iranian citizens released from the United States custody through a side deal to the Iran nuclear agreement. “These individuals weren’t charged with terrorism or any violent offenses. They are civilians, and their release is a one-time gesture to Iran given the unique opportunity offered by this moment and the larger circumstances at play,” PresidentBarack Obama said Sunday. However, among the released Iranian nationals was the hacker who attempted to steal military secrets from a U.S. company. Nima Golestaneh, a 30-year-old Iranian man, was extradited to the United States from Turkey last year after being suspected of a hacking attack against American defense contractor Arrow Tech Associates. In October 2012, Golestaneh successfully broke into the servers of the Vermont-based aerodynamics company, which builds ballistics prediction and testing software, and then plundered its databases in an attempt to steal software worth Millions of Dollars. Federal investigators tracked Golestaneh down to Turkey and then extradited to the U.S. last year to face trial on charges of wire fraud, unauthorized access to computers and money laundering. However, Golestaneh was pardoned by the United States and sent back to the Islamic Republic before being sentenced. It is believed that Golestaneh was part of Iranian increasingly active hacking team that, according to American officials, is targeting both United States infrastructure and defense companies, as well as the email systems of the Las Vegas Sands casino. The prisoner swap comes just a few days after the Iran captured and released 10 United States sailors in the Persian Gulf.